I know everyone might think I’m nuts but I love Bucket Brigade. I like having to push myself as far as my body will let me, and nothing does that more than this obstacle. Originally my goal was to run 2 Trifectas but that won’t happen anymore because of how far I’d have to travel. My new goal is to become a better racer in all areas and complete all races faster than last year. I used to weigh 225 lbs, hated the way I looked, hated my clothes, and wasn’t happy about my life in general. I honestly didn’t love myself. I was on Facebook in November 2013 and saw a sponsored ad for Spartan Race with the title “30 burpees for 30 days.” I didn’t even know what a burpee was, but something in me said, “I want to do that.” The next day I started the challenge and it took me around 30 minutes to complete it. I was inside in the air condition sweating and panting. It was pathetic. I got on Facebook to report that I had started the challenge and saw Amanda Love’s story about doing her burpees. My inner voice said “You can do it, too” since she fought through her pain to complete it. Somewhere in those 30 days Spartan posted the first way to start training for a Spartan is to register for one then tell everyone. I had until May to train and knew I could do it since it was only around 3 miles. I registered that day and posted it and told everyone, so there was no backing out now now. That’s when the negativity started, though. Some of my closest friends and family told me I was crazy and wasting my money. Only athletes and the military do these races. I hadn't run a mile since 2009 and (hearing this) broke my heart, but I didn’t have a choice now. My best friend, Jacob, called me a week later and asked how to register and that I wasn’t doing this alone. That May I finished my first OCR and became an addict. I compete in OCR because it is my therapy. The noises and voices of the world disappear when you’re in the woods or on a mountain, sweating, legs are cramping, and your body is aching. All I can hear is my heart beat and breathing. I become completely focused and the stressors of my life become insignificant. There is no place I am happier. I also do them as a test of how far I have come and so I can see my progress at every race. After I finished playing softball in college I didn’t have anyone telling me that I had to workout X days a week and “this is what I needed to be doing.” I didn’t have a reason to anymore and the relationship I was in ended at the same time. It was my first love and I took it hard. When I started dating again I looked for the opposite characteristics, so instead of dirt bikes, outdoors, softball, and fitness, it was comic books, movies, and fast food. The weight started to slow pile on and before I knew it, I went from 140 lbs to 225 lbs. Then my very best friend, Jacob, sat down and said, “I’m done, you go on ahead.” I couldn’t let him give up and begged him to just walk with me. We just put one foot in front of the other and the feeling I got when I crossed the finish line was indescribable. When they placed the medal around my neck I remember the weight of it and how good it felt. 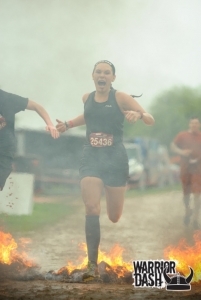 I thought of all the people who told me I couldn’t and who told me I wasn’t a person who could run a Spartan Race. I turned to Jacob and just remember hugging him saying we did it. I was so proud of the both of us and thought at the time that would be my one and only race. The only real setback I had was with my back. This makes monkey bars, the rig, and the rope climb hurt like no other. The more I race, the less it hurts. I fell from the monkey bars due to unbearable pain during last year’s AT&T Dallas race. I made my way over to the burpee zone where I did one armed burpees, almost in tears. Little did I know that the local news filmed the whole thing and I was on TV that night. You said that you had a major medical problem that required emergency surgery. What caused that incident and how did you rebound from it? I had to have an open-subtotal gastric bypass surgery (esophagectomy) because I have a hiatal hernia. It caused my stomach acid to spill out into my esophagus, resulting in erosion and major damage. The doctors decided that removing everything was the best option. They honestly had no clue how I lived like that for so long and why I didn’t have cancer already. I was very lucky and was put on a liquid diet for about a month. 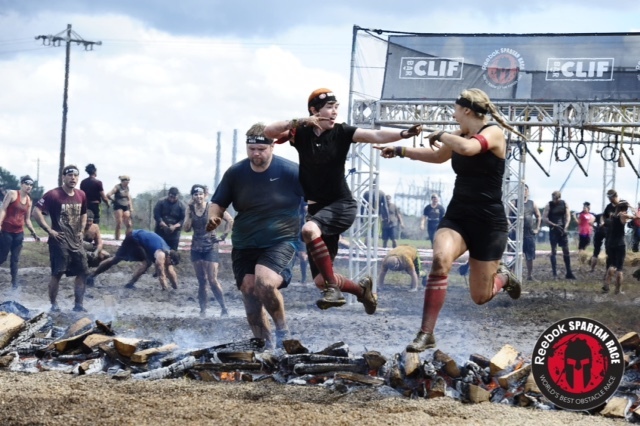 I was very weak and it took about two months to feel like myself again, but I started training for my first Spartan Race about a month after that. How important was diet when it came to turning your life around? Do you have a go-to meal? I started feeling better right away after I cut out fast food and stopped drinking soda. Also, it’s ok to cheat every now and then and I believe you shouldn’t cut out everything from your diet completely. Dieting is torture but it’s supposed to make you feel better. After you do it long enough, you don’t even want to eat unhealthy stuff. Fast food becomes too salty and too greasy, while sodas and sweets have too much sugar. They just don’t taste as good as they once did. Diet was just as important, if not more important, than exercise. I like flavored dressing and can eat a salad every night and never have the same salad if I switch the dressing. Pick every flavor, combine flavors, or try something new. I also learned that if you dip the lettuce into the dressing instead of pouring it on directly, you’ll end up using less. That way you’ll cut even more calories. Your schedule sounds incredibly busy. How do you find the time to balance being a full-time nursing student, working part-time at Lowe’s, and racing often on weekends? I don’t manage my time! I have no time to breathe. I’m at school from 8am-2pm on Monday and Tuesday, and 6:30am-3pm on Wednesday, Thursday, and Friday. I also work 5pm-9pm each of those nights at Lowes. Somewhere in there I’m studying, eating, training, or sleeping. There are times when I can either sleep or eat and I have to choose between the two. I’ve listened to my lectures while at the gym and sometimes read my notes on the treadmill. My training differs depending on the race I’m doing next. For BattleFrog, I work on strength. Spartan is more cardio, while Savage Race, Rugged Maniac, and Warrior Dash are a mix of strength and speed. My go-to workout is run a mile, do 30 burpees, then run half a mile with a 25-lb sandbag or bucket. I’ll do that anywhere from 3-5 times. Working at Lowes helps a lot, too, since I work in the seasonal department. I spend my days carrying lawnmowers, grills, and patio furniture, pulling pallets, and moving 50-lb boxes over and over again. Ten years from now I hope to have my BSN (Bachelor of Science in Nursing) degree and to be working in a trauma one unit at a major hospital. I’d also like to be married with little Spartan kids running the kid’s race, spending my weekends earning as many Trifectas as I can in a year. Anyone can do it. It has nothing to do with background, age, gender, or weight. It has to do with how stubborn you are at the core. Can you get to the point that no one, not even you, can stop you? I’ve been on the Dean’s list both semesters of nursing school so far. I love following the elites. Amelia Boone and Hunter McIntyre are my favorite two because their personalities remind me of me. I hope to one day be at their level. I’ve met Amelia and high-fived Hunter last year at Glen Rose. However, the two people who are the reason I am where I am today are Amanda and Todd Love. I did my first 30 burpees for 30 days everyday with her, and when she refused to stop, I knew I had no excuse to stop either. I will get my second Trifecta this year. I’ll also be running 5 Spartan Races, 2 BattleFrogs, 1 Rugged Maniac, 2 Savage Races, a few 5k road races, and my first half-marathon. As of now I have 13 medals. I hang them on a wall and every January I take them down and start again. I have a room with my other childhood accomplishments and keep the old ones there. 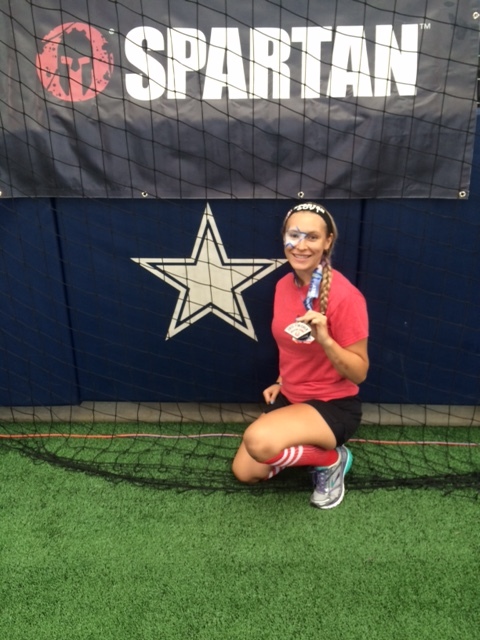 My first Spartan Race Sprint medal hangs from the mirror in my car. Glen Rose was 6 hours away, but I hope to run in Vermont, Colorado, and maybe Hawaii one day. Pretend you’re a race director for a day. Describe the course you would design. My perfect course is the Austin Spartan Race course. The view and scenery are perfect for a race and 10 miles is the just right distance to push myself. I would want an obstacle every quarter mile and would bring back the tractor pull, mainly because I enjoyed it in my first race.